Heroes in a Half Shell - Turtle Power! Teenage Mutant Ninja Turtles, Teenage Mutant Ninja Turtles, Teenage Mutant Ninja Turtles, Heroes in a half-shell -Turtle power! Sorry about that, but now it's in your head it might as well be ON your head! 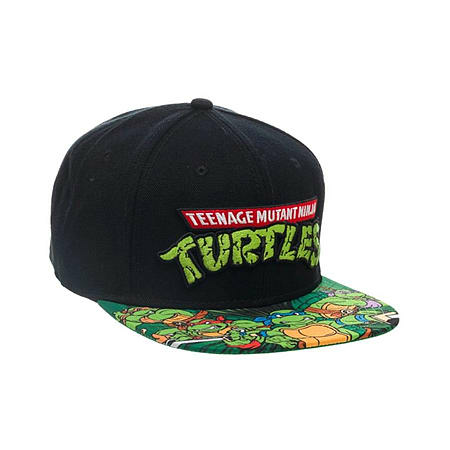 Our Retro Style TMNT Snapback Hat will take you right back to the 80's, when this TV Series was first popular and the Ninja Turtles were a little less scary. Our Snapback features embroidered logo detailing on the front and Cowabunga embroidered on the reverse. It has all four Ninja Turtles on the bill, in a classic 'ready for action' pose and has air holes with an adjustable band for comfort and fit. Just like Mickey, Leo, Raph and Donnie our Snapback Cap is hard-wearing and made from the perfect mixture of Acrylic, Wool, Polyester and Cotton. What a team!